As I’ve gotten older (I say at a quarter-of-a-decade old), I’ve cultivated a love for simplicity. My husband is probably shaking his head as he looks at my over-flowing drawer of running clothes, but it’s true. In college I definitely fell into a more-is-more mindset. I’d blow-dry and flat-iron my hair, I’d pile on makeup, and I’d add even more height to my five foot nine frame with heels. I’d develop complicated weekly workout routines that involved Yogalates, complex kettlebell moves, and high-intensity treadmill runs. I’d order mixed drinks like fruity margaritas at bars. Cooking and food was no exception during these years. I’d spend hours cooking complicated recipes such as lentil burgers, quinoa mac and cheese, and fat-free cakes with frostings and fillings, and I’d add seasoning upon spice upon seasoning to each meal. Now, I prefer simpler things. My morning routine is concealer, powder, blush, eyeshadow, mascara, and done in fifteen minutes, and flat-iron has not touched my hair in nearly two years. I stick to mostly running with simple bodyweight exercises and some basic yoga or Pilates thrown in for balance. Instead of fruity cocktails, I stick to simple craft beer, cabernet sauvignon, or Scotch. 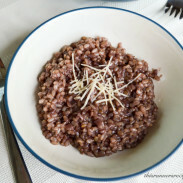 My cooking has adapted that same mindset; even my fancier dishes of red-wine risotto still reflect simplicity, without a lot of spices or add-ons. 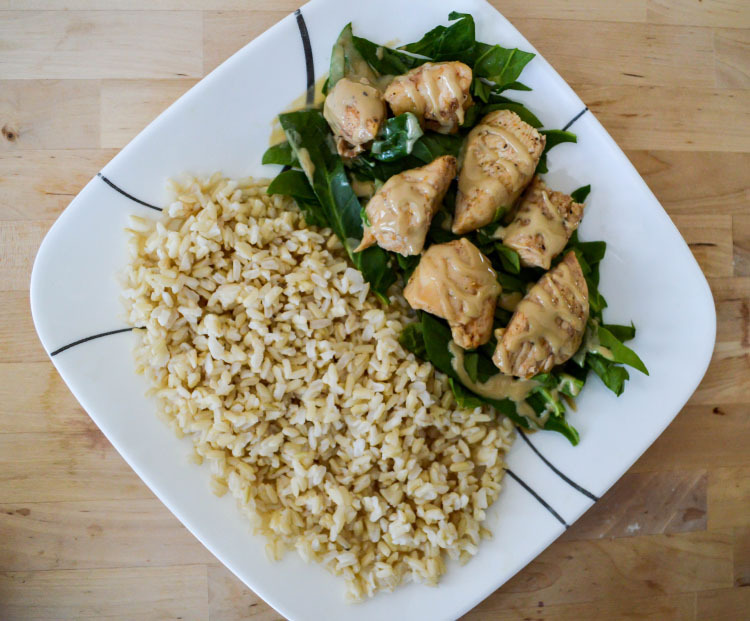 And what’s simpler than chicken and brown rice? Not much, if you ask me. Maybe my beloved roast chicken and roast vegetables, but chicken and brown rice is pretty straight forward. These two humble foods offer lots of nutrients and are a canvas for whatever flavors you crave. Some nights I season them with just simple salt, pepper, and garlic. Other nights, like for this meal of Mediterranean Spiced Chicken with Brown Rice, I added a touch of spice. The spices in this meal are simple spices that you probably already have in your pantry. A touch of paprika, a sprinkle of garam masala, a few cloves of minced garlic, a dash of salt, and a grind of pepper. I used garam masala because we were out of cumin, so feel free to use cumin instead, especially if you don’t have garam on hand. Simplicity also means meals that come together with minimal hands-on time. No intensive laboring over the stove for this meal. 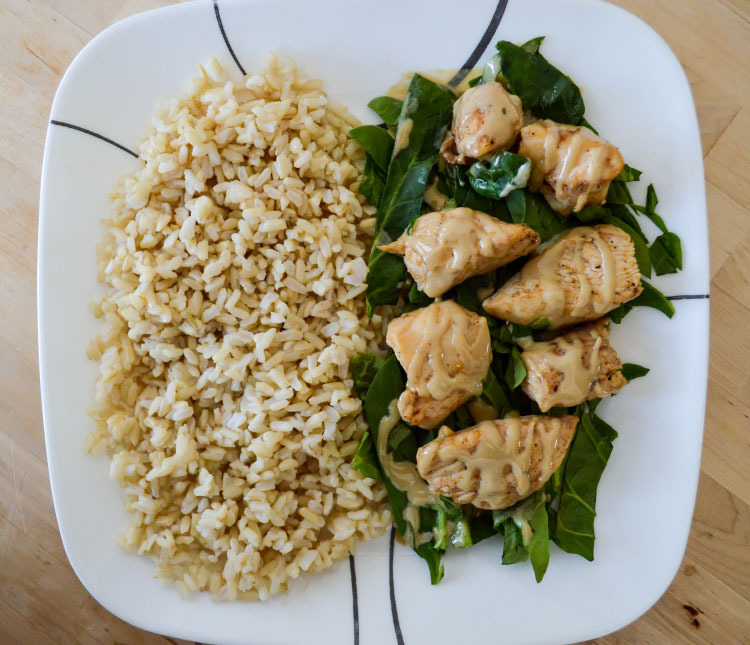 You simply add the spices to the chicken and let them absorb while the rice cooks; then the onions and chicken cook in less than 15 minutes and a quick drizzle of tahini brings the meal together. and consulting it constantly. It’s to my cooking what the McMillan Calculator is to my running—that can’t-live-without go-to resource. I was reading about cooking rice and beans and uncovered the secret to cooking brown rice: the oven. Baking brown rice instead of boiling it produces consistently fluffy brown rice, with no burnt bits or gumminess. Most of all, it’s less hands-on, quicker, and overall easier than boiling the rice. You simply boil twice as much water as rice, pour the water over the rice in an oven-safe pan, cover with foil, and bake at 375 degrees for 1 hour. When I tried this method, the rice was delicious and the perfect texture both right after cooking and when reheated the next day. 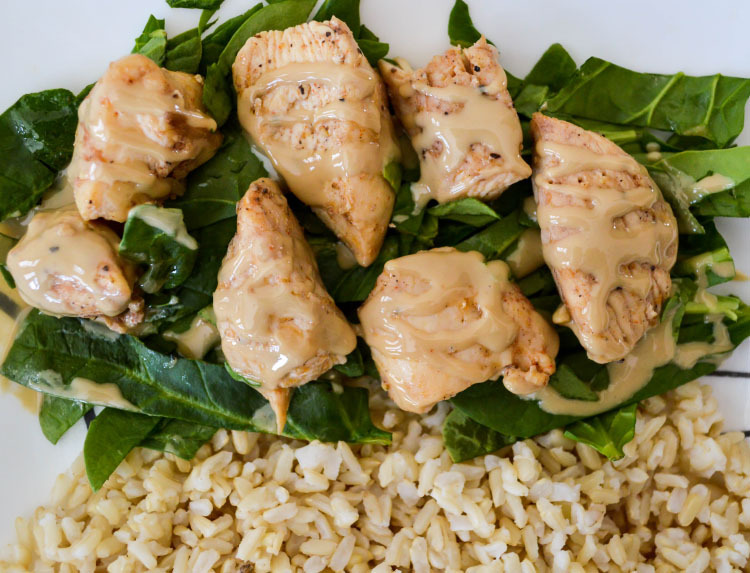 If you’re like me and also delight in frugality, this recipe is easily modified to use roasted chicken. For one of the test meals, I simply added the spices to already cooked chicken from the bird we roasted a few nights earlier and heated it up with the onions after they had caramelized. 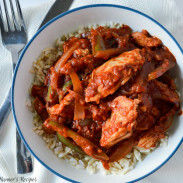 It tasted just as delicious and spicy as when we made it fresh chicken breasts. Combine the water, salt, and butter in a pot and bring to a boil. Pour the water over the rice in an oven-safe pan, stir together, and cover the pan with aluminum foil. Bake the rice for 1 hour. When done, remove the foil and fluff the rice with a fork. While the rice is cooking, season the chicken with lemon juice, spices, and garlic. Let set for thirty minutes to absorb the seasonings. Heat the olive oil in a pan and add the onion. Saute until translucent and soft, then add the chicken and cook until done. 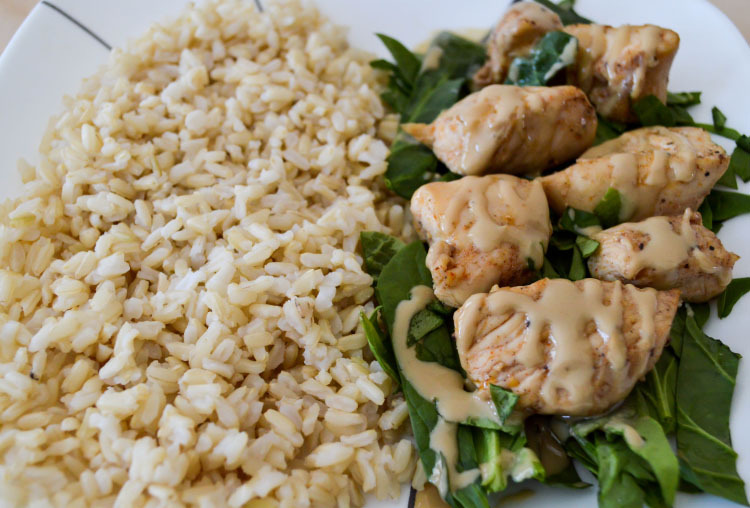 Drizzle the tahini sauce over the chicken. 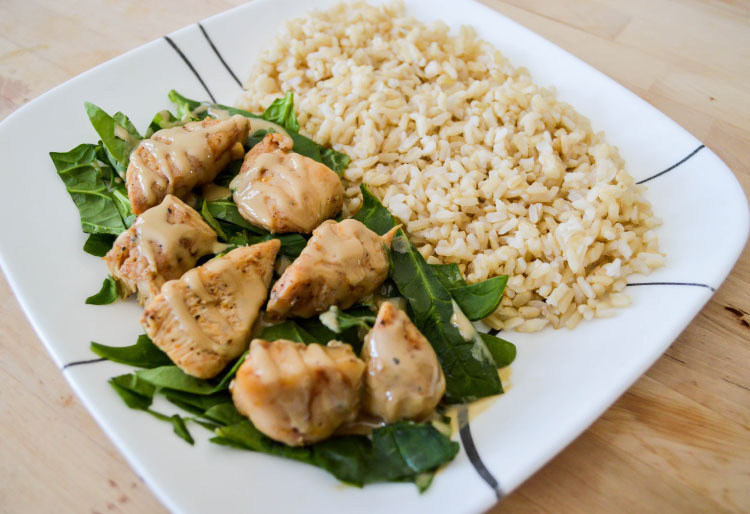 Serve the chicken, onions, and rice over the spinach. Because sometimes you just want a meal that’s subtly spicy, simple, and satisfying. (Disclaimer: This post contains an Amazon Affiliate link). This is my sorta meal! 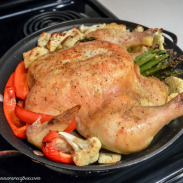 I love simplicity and this chicken sounds absolutely amazing!